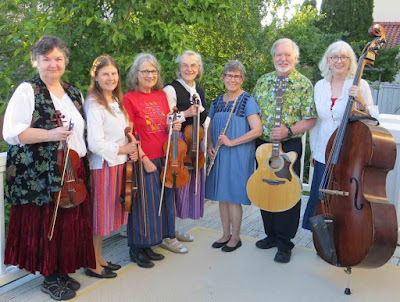 December 8, 2018 Holiday Folk Dance Party sponsored by Sno-King International Folk Dance Club and Northwest Folkdancers, Inc.
7:00pm to 10:00pm at the Cedar Valley Grange, 20526 52nd Ave W, Lynnwood. Dance to Live music from Allspice band, with recorded requests during the band break. This will be a big dance with members of several clubs participating. Join us in doing dances from around the world. We do couple, no-partner, and set dances, and you don't need to bring a partner. The Grange has the best dance floor around, and lots of free parking. Wear an ethnic costume if you have one, or just your holiday togs. Finger food potluck snacks are encouraged.